Wow. Another big round next week. Spartans will definitely be playing Gladdies week one of Finals. 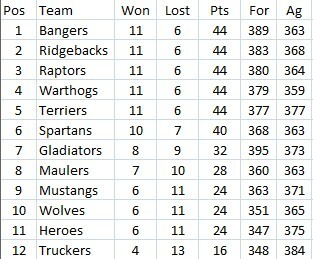 Macca wrote: Spartans will definitely be playing Gladdies week one of Finals. Didnt think it was possible to ruin my weekend any further, so thanks for that. Maybe rest some players for the finals Jase? Macca wrote: Maybe rest some players for the finals Jase? If only that would help! Besides if I rest players that would give Pez an easy win. I should at least try to make him earn it shouldnt I? Pez will PM you with some stupid deal to let him win...I guess your integrity is on the line here? Did you learn nothing from Biff on Back To The Future 3 when he got his hands on the Almanac and tried to manipulate the future? Intriguing that, as Banger pointed out today, if he loses, he could (in theory) end up in fifth spot.